I posted my first impressions of the iPad Pro yesterday, and having spent much of the past 24 hours mostly using it rather than my MacBook, I now have more of a sense of why Tim Cook thinks it could be a laptop replacement. While most reviewers dismissed that, and I would certainly join them in doing so when thinking of you or I, it’s easy to forget that we are not normals. We want the power of pro apps, and the ability to do plenty of multitasking. We’re a very different user case to the average non-tech user who rarely ventures further than email, web, chat and a bit of light photo-editing. I’ve said before that when non-tech friends ask me for advice on which laptop to buy, I quiz them on what they want to do with it and often end up recommending an iPad and keyboard instead. With the increased screen size of the iPad Pro, I can see myself doing that even more often in the future. Sure, it’s expensive for what it is, but it’s a hassle-free, flexible device with the option of built-in LTE. For many, that makes it a better option than a MacBook. Considering that it’s just a bigger and faster iPad, it’s amazing how different it feels to a standard iPad – even one with a keyboard. The size really does make it feel like a different category of device. That’s partly just the sheer expanse of that gorgeous screen. It’s pretty much the same size as a 13-inch MacBook, and a very common size for non-Apple laptops. It doesn’t feel in any way constrained. And it’s partly that, for the first time, I feel like an iPad is a viable device for multitasking. Sure, I can use Slide Over and Split View on my iPad Air 2, but I rarely do. The screen just feels too small for that. But Split View on the iPad Pro is great. Extremely usable. You have a decent view of both apps, so for the first time reading from one app while writing in another doesn’t feel cramped. Granted it’s limited to two apps, but this is almost Mac-standard multitasking. Anything involving photo or video is fantastic. Netflix addicts will love it. Not only is the screen a great size for personal viewing – and for two at a push – the speakers are loud. Really loud! And stereo makes a big difference for some movies. While the speaker volume is a massive improvement, the quality is still just in the ‘ok’ range. You’re never going to get great sound out of such small speakers when it comes to listening to music, but for movies they are more than good enough. Oh, one small niggle in the Music app: the now-playing bar and controls are still really tiny, and look even smaller on this size screen. Apple really needs to take advantage of the screen size to make them bigger. I absolutely love how good photos look on this screen. The size means that showing someone a photo on this is exactly like handing them a 10×8 print in the old days – you feel like they’re seeing it properly. I’ve played with Lightroom on my iPad Air, but never really seen it as anything but an emergency option. But on the iPad Pro, it really feels like a viable option for the first time. I’m certainly going to try it. A4/US letter documents may not have the wow factor of photos, but it’s terrific to be able to view them at almost full size. No scrolling, no zooming, just comfortably read an entire page at a time. The screen size also makes a big difference with maps. On a standard iPad, I find myself doing quite a lot of scrolling around once I’m zoomed in close enough to see the street names, while the Pro lets you see a lot more at a time. Finally, I don’t do many games, but X-Plane is really something at this size (though iOS 9.1 did kill the audio, something which will hopefully be fixed soon). I’ll let others more into games say more about this, but my guess is that if you’re an iOS gamer, you’re going to adore the iPad Pro. I have a few complaints aimed directly at Apple. A very minor one is that the iPad Pro doesn’t get the new super-fast Touch ID fitted to the iPhone 6s. I don’t really care, but it does feel a bit off that the latest shiny new piece of kit – given a Pro label, no less – gets old tech. However, Benjamin has suggested this may be for supply-chain reasons, that Apple simply can’t make enough of them to meet demand for the news iPhones, and that seems plausible to me. Far less forgivable, in my view, is that the iPad Pro lacks 3D Touch. That’s a feature that makes a massive difference to iOS, and it really ought to be there in the latest top-of-the-range iOS device. I mentioned yesterday my biggest complaints about the iPad Pro: the ridiculous waste of space on the Home screen, and the fact that many apps – even some of Apple’s own – are not yet properly optimized for it. The body of the email looks like it has been copied directly from the iPad Air and just pasted into the center of the iPad Pro’s much larger screen. There’s little point in having all that lovely real estate unless apps allow us to use it, and to see this in one of Apple’s own on-board apps is really very poor. Other apps just look absurd, like some kind of child’s toy. 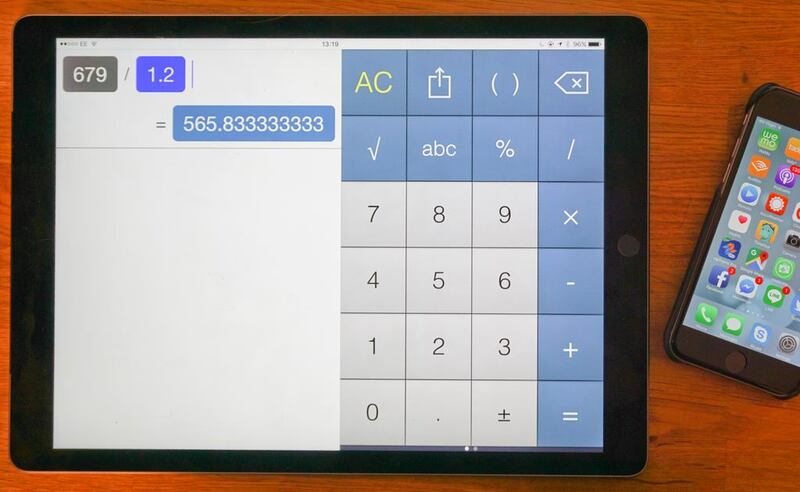 I love PopCalc, for example, but you need the scale provided by the iPhone 6s in the above photo to see just how ridiculous it looks at this size. I’m really not a fan of touchscreen keyboards. The standard iPad one was a good effort, but I still hated using it. But the combination of the physical size, and constant number/symbol row, makes the iPad Pro version incredibly usable. I wouldn’t want to be writing this piece on it, but for emails and the like, it works well. Which is another complaint about apps: so far, only a handful are using the new keyboard – many call up the standard iOS one, and that one not only looks silly but has such over-sized and widely-spaced keys that it’s actually harder to use than on standard iPads. Apps in general need to think about how to use the extra space – but as I mentioned yesterday, developers may well take the view that it’s such a small market it’s not worth the effort. We’ll just have to wait and see on that one. I love, love, love the size of the screen. As I said in the intro, it really does make it feel almost like a whole new category of device. But of course that comes at a price – and not just a financial one. My iPad Air 2 slips very easily into my smallest bag, and even with the Brydge keyboard that goes with it, I scarcely notice it’s there. That’s not true of the iPad Pro. 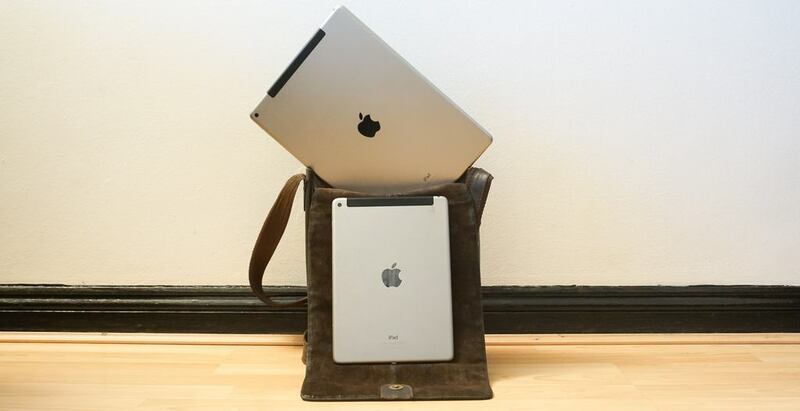 I need to use the same bags I currently use for my MacBook Air 11. Not only that, but the combo of the iPad Pro with Logitech CREATE keyboard is actually heavier: a total of 3lb 4oz versus 2lb 6oz for the MacBook. So the first question I have for myself is: do I want to sacrifice that much portability? Given that my iPad goes everywhere with me, it limits my choice of bag and weighs me down more. The second issue is the unwieldiness of the Pro in some uses. I already mentioned yesterday that typing on the handheld device really is horrible – you definitely want to put it down somewhere to do that. With my iPad Air 2, I frequently hold it in my left hand by the left-hand edge while I use my right hand to touch the screen, and that’s perfectly comfortable. With the iPad Pro, it’s really not! You might think the extra weight is not that big a deal – after all, the first-gen iPad actually weighed almost the same as the naked iPad Pro (quite an amazing thought in itself!) – but there is the small matter of Archimedes. The lever principle very much applies here: holding the iPad Pro in one hand in landscape mode, all that weight is trying to lever its way out of your hand. The iPad Air 2 feels truly featherweight in comparison. The unwieldiness also really makes itself felt if you use the device in bed, for Netflix or to read books. It’s far too heavy to hold up in the air above you, and even lying on your side – with the iPad’s weight taken by the bed – it suddenly does seem very big. It feels a bit like you’re in bed with a laptop rather than a book. So, these are the two factors I need to balance out: my love of that big screen versus the reduced portability and clumsier handling. In a perfect world, I’d want to keep both devices, switching between them depending on what I’m doing. But having that much money invested in iPads, especially when I already have (with rather dubious justification) both a MacBook Pro and a MacBook Air, would be truly nuts. So I am going to have to choose, and I’m not sure yet what that choice will be.